Giulia Delladio deals with strategic marketing. Her role in the family’s company consists of setting out the guidelines for developing the La Sportiva brand and products. To make this happen she cross-references the market demand, analyses the competition, the feedback coming from the sales managers, the agents and shop owners and above all she keeps track of the trends - «Not only the ones in the outdoor sector» - she points out. She is the only woman in a context and lineage of only men and when she is asked if she considers this factor an obstacle or rather an advantage, before answering she seems to need some time to think about it: she probably wants to measure her words. «I consider being a woman as an opportunity. I try to bring to the company alternative interpretations or different ideas. Sometimes, during our meetings, I call their attention to things that nobody has paid attention to before. I notice details, I notice the little things. Usually there is a moment of disorientation which follows my analysis or my observations, then the factors on which I focus my attention are usually re-examined even by the others in a different perspective. This doesn’t mean that my feelings and my opinion are more important or more useful than those of my male colleagues, but simply that mine is a different way of looking at things. Men and women see things differently. It seems that together, men and women, manage to think differently». When Giulia explains herself you can tell that her answers are close at hand, probably like all the answers or points of view she is used to giving in the company. 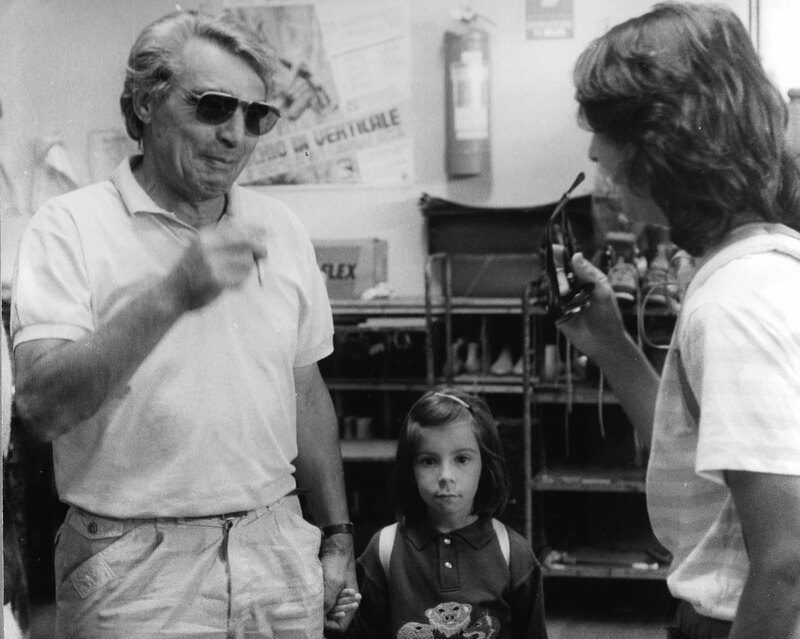 Giulia has been at La Sportiva since she was nine years old, ever since her wish to go to a trade fair to help her grandfather Francesco and daddy Lorenzo was granted for the first time. La Sportiva is not only her job, it is part of her DNA. My grandfather Francesco was a visionary. He contributed with passion and the desire to grow and he laid the foundations for future development. He is the who has allowed this company to grow with his ideas and his choices, giving a sound basis for the future. Francesco was an innovator and he led the passage from the company’s artisanal phase to its industrial one. He had the gift of picking the right person for each role, he was a person who knew how to listen and believed in people». Then comes the moment to move on and talk about Lorenzo. That is what she and her brother call their parent, by his first name. If you’re not used to it, it sounds strange. «Even back home, for us children my father was always known as Lorenzo. He was known as Lorenzo at work and was Lorenzo even at home. Since I was young the two things - family and work - went hand in hand. Lorenzo was the man that internationalized the company, he was the man of La Sportiva’s boom years. Starting off from the success of climbing shoes he was able to expand this company and make it rise from a European dimension to a global one. In line with the family’s entrepreneurial spirit, he was able to lay a solid base to create an international distribution network to grow in every market, in every continent». Then comes the moment to speak of herself and her role in the future company. Even in this case Giulia is cautious and sensitive when she starts to talk, it is clear that her words have been chosen carefully, and are spoken with great attention and sense of responsibility. The answer is ready, once again close at hand. She has clear ideas: «I feel that my job is to combine tradition and this company’s identity with innovation, to keep up with the times. The fundamental passage which La Sportiva has to deal with is that of moving from being a shoe factory and product-oriented company to a brand. And this is the challenge we have to face up to over the next few years». There is a photo album on the table in front of us, the photos were taken at the presentation of the Mythos shoe with the team of athletes in 1990. We leaf through it. Giulia explains that those photos have a special meaning for her, they were taken by Igor Koller, the first one who cimbed the ‘Via attraverso il Pesce’ in Marmolada. «Igor made these albums carefully by hand, then when he came to Tesero he would bring them to us. We kept them at home, not in the office, the albums were important for us. I am very fond of this one especially as I am very attached to all of those athletes, what we had with them, above all, was friendship, they weren’t simply collaborators or sponsored athletes. This is what the company consists of: relationships and people, this is one our greatest values. Our strength lies in our shared past. I remember my grandfather Francesco holding my hand while talking to all the athletes in front of us, at the presentation of the Mythos shoes. I remember Manolo coming from Transacqua to Tesero to pick up his climbing shoes, on his road bike. I remember that he came to our house to pay us a visit, he would eat an apple, then he would set off back home after slipping the climbing shoes in the back pockets of his cycling jersey. I remember Stefan Glowacz every time he came to the headquarters, he would bring me a soft toy. I remember all of the Rock Master editions. La Sportiva stand and the bits of leather thrown on the tables to display the samples. I remember running across the grass to grab a seat under the climbing wall ready for the competitions. To save our seats we would lay a blanket out. I remember François Legrand who spoke Italian really well. I remember the fax machine. I remember Lorenzo sending faxes to the athletes during the evening. I remember sending Didier Raboutou and Stefan Glowacz one of my drawings by fax. I remember at school when we would draw, I always and only drew the Rock Master wall, and my teachers didn’t understand what that brown rectangle was which I stubbornly chose to draw every time. I remember the athlete’s meet for the presentation of the Mythos climbing shoes. I remember the green ladder which went down from my house to the production area which was huge and scared me. I remember that I was sitting on the side of the table where I wanted to be, near Lorenzo and near my granddad Francesco. I remember that Salavat Rachmetov spoke only Russian, I don’t know how they could all understand each other with Lorenzo and Francesco. I remember that Lorenzo and Giuliano Jellici did not speak English and Luisa Iovane translated what the athletes were saying. I remember the Valle di Fiemme brochures. I don’t know why. We had forgotten to take it off.